My now wife, then girlfriend, had dated for 7 years before I had the courage to propose to her. I’m not sure why I waited so long, perhaps it was a feeling of insecurity or maybe commitment. Nonetheless, I knew I loved her and wanted to spend my entire life with her. The important thing is that I made the right choice in the end. The proposal consisted of three phases to pull it completely off. Since we’ve dated for 7 years, the thought of marriage was deeply entrenched in both of our hearts and minds. She knew that I would propose to her, it was just a matter of when, where and if I was financially capable to step the next step forward. In her mind, she thought that I was holding off because of financial hurdles. That wasn’t necessarily the case. I had already gotten her the perfect rock to pop the question with. The only thing left was how and when. I wanted to surprise her; I wanted it to be totally unexpected; I wanted it to be different and unique; I wanted it to be something that was uncharacteristic of my normally daunting personality. How would I do it? To start, I told her: “Babe, lets on go a road trip. Let’s hit up Big Sur, CA just for the hell of it. I’ll book us up for a couple nights.” On our second night at Big Sur, I had pre-arranged a small private picnic with a camp fire on the sandy beach. When she got first glimpse of it, she was certain a proposal was store and became increasingly excited. The night ended without a proposal, but we still had fun. I didn’t want to propose to her at Big Sur. The following weekend, I told her to back her bags again for another two nights. I said, “Big Sur was beautiful, but let’s do something more upbeat. How’s Vegas. I booked us the Palazzo for two nights. Let’s party and maybe make some cash at the tables”. When we got to Vegas that weekend, our hotel room was dressed in rose petals and candles across the room. A bath was even drawn for her and had the same rose petals and candles. The atmosphere was definitely romantic. To top it off, I had a dinner arranged the night that we arrived on the balcony of our suite. After seeing all that I’ve done, the thoughts of a proposal entered her head once again – and once again she left disappointed as I never intended on proposing in Vegas. The next weekend, I went to her and said “Okay Vegas was exciting, but I would like to pampered. I book us a couple nights in Sedona. Let’s enjoy massages and their hot springs”. So that’s exactly what we did with a private moonlit dinner on our second night. Again the thoughts of a marriage proposal came across her mind, but again I had no intention on proposing in Sedona. By now she is completely defeated and emotional; she even cried to me but would tell me the cause of her tears. I believe she had her hearts set on a proposal and leaving without one was too hard on her. On our road trip home I told her, “Don’t be sad sweetie. I got another surprise. We’ll be going to Disney World in a couple weeks. We’ll have a lot fun there and I have a magical surprise for you there.” Immediately, she turned gitty and ideas of me proposing with the help of Disney characters came to mind. The idea was spreading to her best friends as well. Everyone was anticipating a proposal to her from me in Disney World. The conversation was now about how I would do it and not when. Disney World would be a magical place to propose, but it was never my intention. I wanted to propose to her prior to Disney World. So on the fourth weekend (the weekend prior to our Disney World trip), I decided to take her to Santa Barbara where I reserved a large private villa in a rose plant farm. 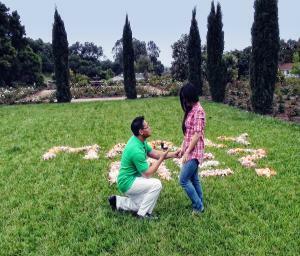 It was Santa Barbara where I wanted to propose and had intended to do it all along. Once we arrived, we had a private dinner in the Villa and went into town to visit what Santa Barbara had to offer in its night scene. After we called it a night and she was tucked away into bed, I had the rose farm curator lay 3 barrels of rose petals on the property’s large lawn. The rose petals were to spell out MARRY ME. I then took 1 more barrel of rose petals and laid down a trail with it that led from the villas front door to the lawn area or proposal site. The entire arrangement and staging happen when she was asleep. When she woke up the following morning, there was a letter waiting for her. It said to meet me downstairs outside on the front patio for breakfast and that I had order us something from the local diner. When she made her way down and out to the patio she saw the rose petal trail and another letter. The letter simply said please following the roses. She did just that and found her way to me and my marriage proposal. She said nodded her head to say YES! Afterwards we went to the patio where I had the breakfast ordered from the local diner. It was a perfect morning. The following weekend we went to Disney World for a week. It was perfect way to unwind and celebrate our new found relationship status as recently engaged. The Disney park and their staff went out of their way to help us celebrate. We received words of congratulations and best wishes throughout our stay. I hope you enjoyed my lengthy description. The link below is a video that I edited that displays clips of our marriage proposal and engagement session. Please visit it and share your thoughts if you have the time to do so. Much oblige.